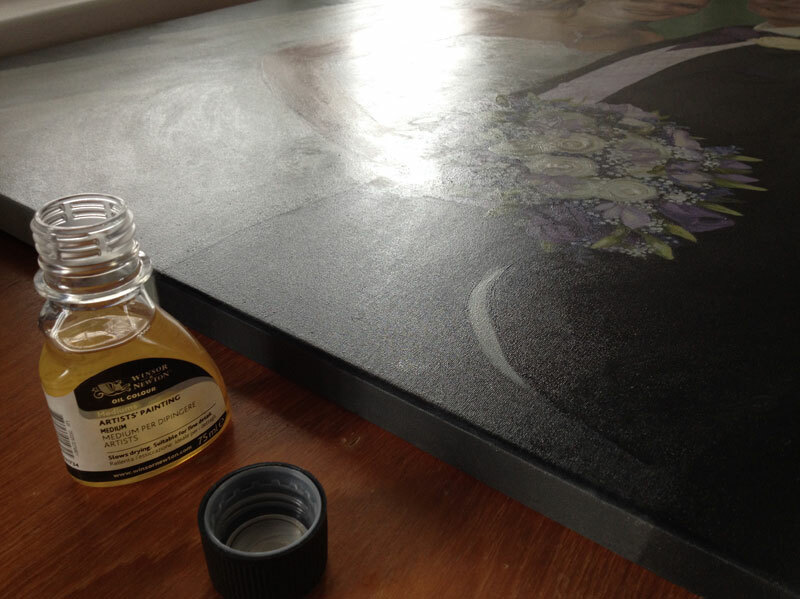 Here’s my final instalment of the wedding portrait in progress series before I unveil the completed painting. 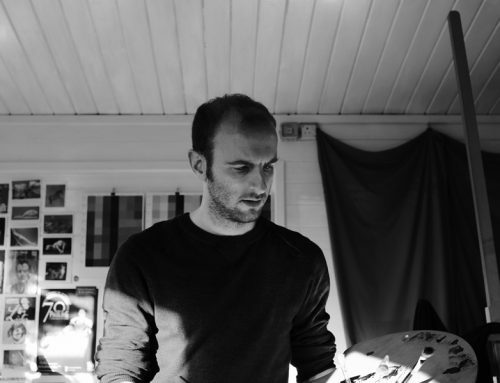 In this blog I talk about some of the all important final changes and finishing touches. As I showed in part 6 of this series I have made an important change to the background, opting for a simple textured green rather than the distracting landscape that I had originally planned. After applying an additional layer to the background I am now much happier with the balance that has been achieved within the composition. 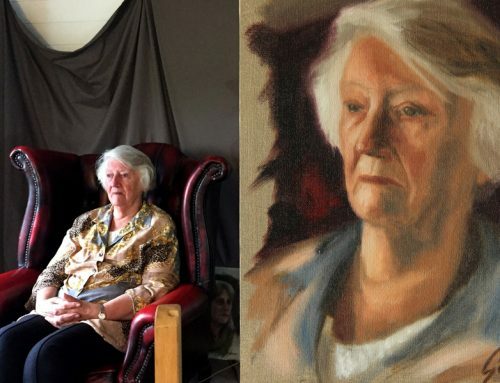 I have also had to make some other quite significant changes late in the development of this portrait. 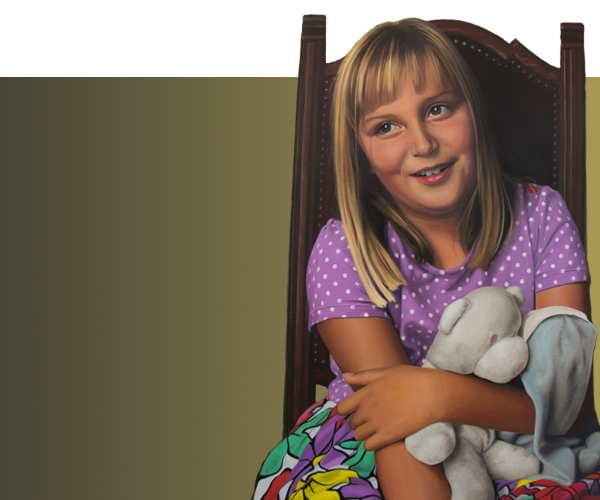 Throughout working on this portrait I have been unhappy with the forearm and hand which I felt looked inaccurate and distracting to the eye. If you compare earlier photos of the portrait to image 1 below you can see the subtle improvements that I’ve now made. 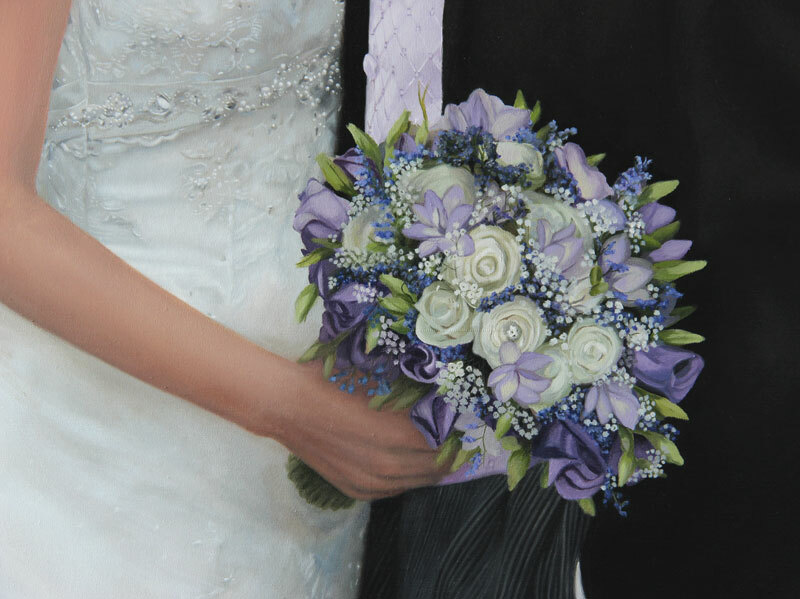 By changing the shape of the hand and making the handle of the bouquet shorter I solved the key issues with this part of the painting. Next I added more flowers to the bouquet to ensure the shape looked accurate as it tipped away from the happy couple toward the viewer. 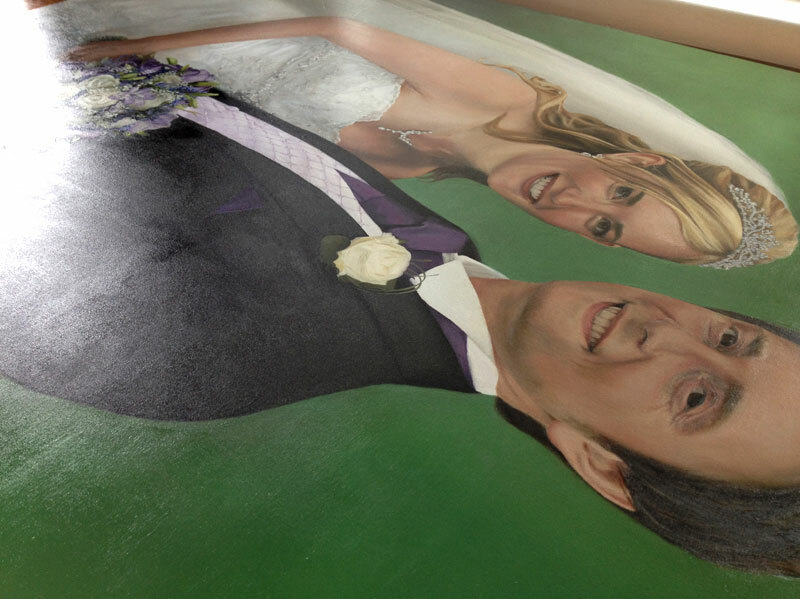 Image 1 also shows some of the finishing touches I applied, where I painted the stripes of the groom’s trousers. I have also painted an additional layer on the groom’s suit jacket which was looking a little thin and sunk-in previously. 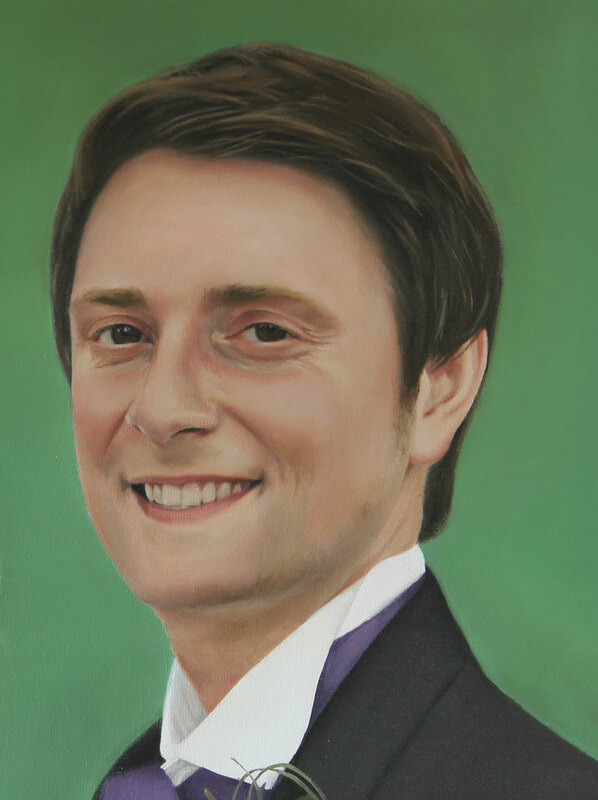 Image 2 shows a close up of the groom’s face, a part of the painting that I revisited to make some careful changes. I felt that some shifts in skin tone were a little too over defined while other parts were lacking a little colour making the face seem flat. I find that it’s often through making these final small changes that you work out and identify where other (often bigger) issues lie. For example, through improving some of the blending on the face I realised that the ‘smile line’ needed some slight adjustments. It wasn’t visible enough near the corners of the mouth and fixing this in turn improved the overall smile of the groom. Images 3 and 4 were taken as I oiled out the painting when it was touch dry. As you can see in the photos I laid the portrait flat before carefully applying a small amount of Artist’s Medium to the surface of the canvas using a lint free cloth. 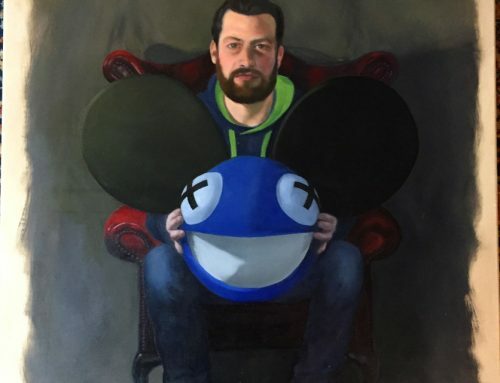 Areas of the painting that had sunk-in a little, such as the groom’s dark hair and parts of the suit jacket, were brought back up to a more vivid finish. Applying the medium helped establish a more uniform sheen to the portrait that, apart from varnishing, I’m now happy to say is complete.